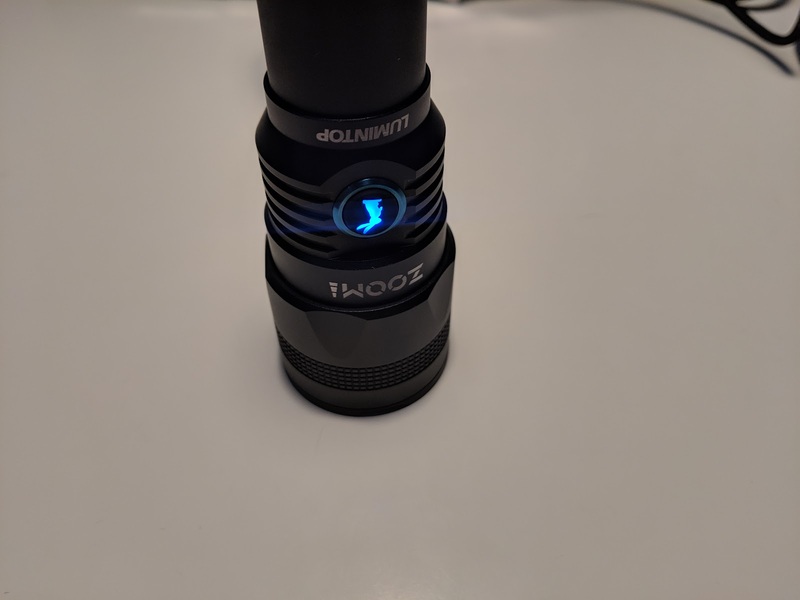 Lumintop sent me their latest light, the Zoom1, for review. 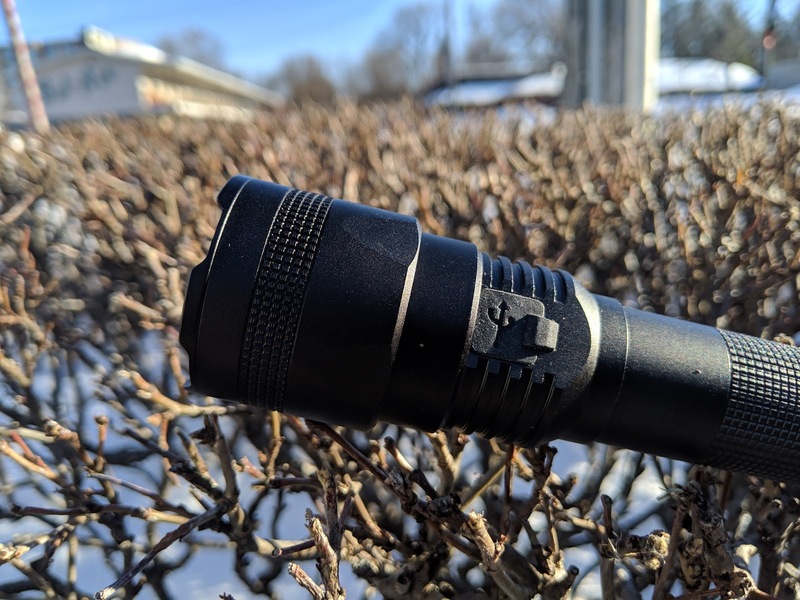 This is a single 18650 light with an adjustable focus. The light has a single side switch for control, and features integrated micro-USB charging. Focusing lights, or "zoomies" seem to have a very polarizing effect. Most enthusiasts are strongly against them, and many non-enthusiasts refuse to use anything else. This was my first time trying one out since getting in to this hobby, and I think both sides of that argument have some merit. 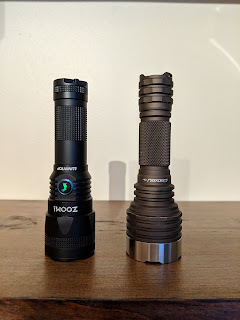 The Lumintop Zoom1 is not the throwiest light in it's size class at all, but it does have a beam with some reach to it. And, unlike other lights optimized for distance, you can change the beam shape for close up use. Even compared to other floody lights, the even beam that this optic makes is great for short range use. The UI has a few shortcomings I wish could be changed, but also has a momentary low. The built in charging is convenient, and the always on indicating LED is a great way to make sure you don't lose the light in the dark. 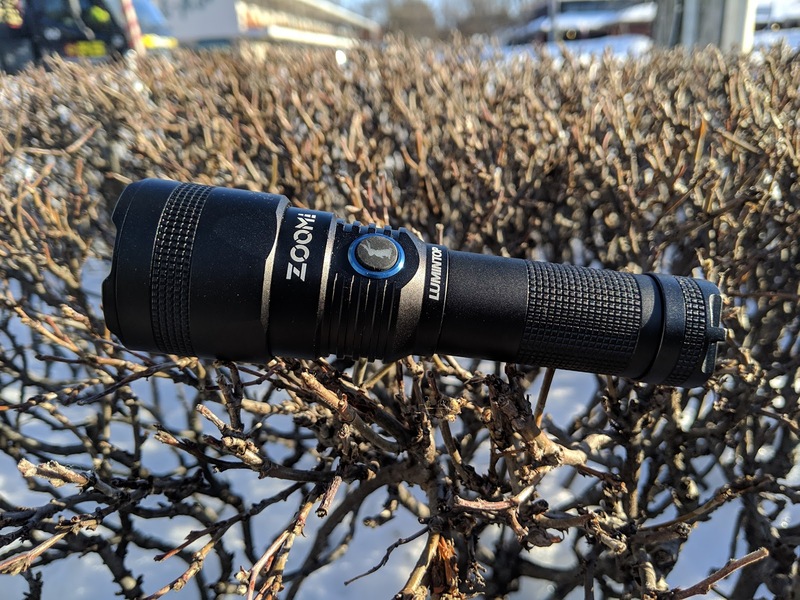 If you're looking for a light that can zoom, and you can live with limited waterproofing and long press for off, this is a great option. The light measures 125.7 mm long in flood, and extends to 151 mm. 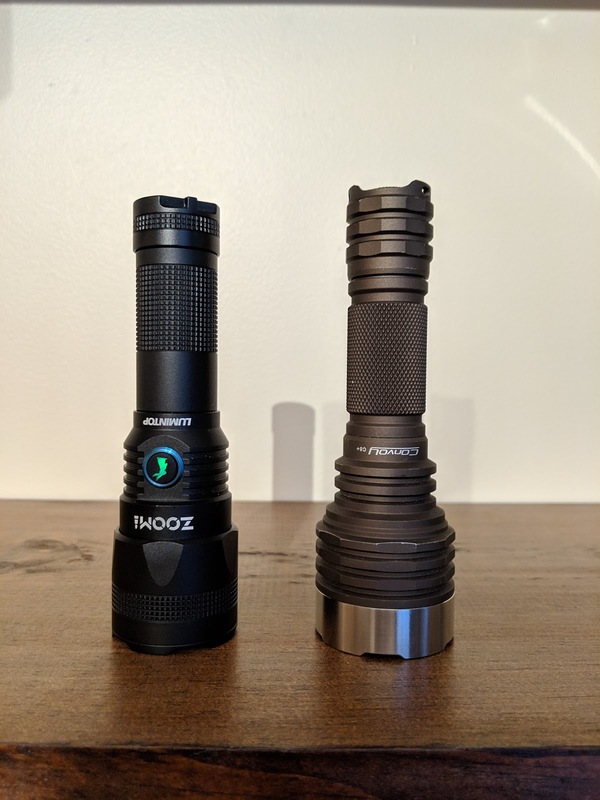 The head is 39.9 mm across, and the cell tube is the narrowest part of the light at 25.3 mm.The light itself weighs 126 g, and adding the included cell brings that to 173 g.
Compared to the Convoy C8+, the light has a slightly slimmer head, and is much shorter - especially when zoomed out. The bezel of this light is slightly crenelated, and hold the plastic lens in place. 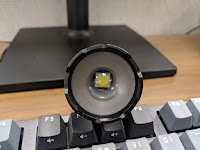 There is no glass window in front of the lens - this means more light makes it out the front, but we'll have to see how the lens resists scratches over time. The lens is set back slightly from the bezel, which should help. Around the head, there's some square knurling. I really like the look of this style. There are also 5 flat surfaces cut into the bottom of the head, which add some roll resistance to the light. When zoomed in, a smooth section is visible with the model name etched into the anodizing. 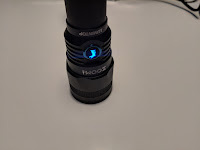 It should be noted that, due to the zoom action of this light, the light is rated as water resistant and not water proof. It should handle a bit of rain fine, but submersion is not recommended. This is by nature of the zooming mechanism. The lower part of the head has 4 fins cut most of the way around it. On one side, the switch is held in place with a blue stainless steel retaining ring, and the Lumintop brand is etched into the anodizing. The button has the company's bunny logo on it, and it glows one of three colors to indicate the status. The switch is always lit while the cell is connected, which I like a lot. The opposite side of the light houses the micro-USB port for charging, which is protected behind a rubber cover. As much as I don't like rubber flaps like this, I will say this is one of the better ones I have felt. It seals well, closes easily, and doesn't open accidentally during use. The cell tube is cylindrical, covered for most of the length with the same great square knurling. The tailcap has a strip of the same knurling again. The end is flat with an indent in the center, and the light has no issues tail-standing. There's also a lanyard loop on the tail. Inside, the light has large square threads. These threads are anodized, meaning physical lockout is possible by slightly loosening the cap. A large silver spring serves as the negative cell contact. Looking into the light, the head end of the tube uses a smaller spring as the contact. The cell tube walls are very thick - I measured them at 3.2 mm. The zooming design means that ergonomics come into play more so than they do with other lights. The head is pulled in or out to change the zoom level, and features a knurled grip to facilitate this. 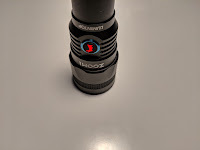 In my own use, I found it was comfortable to grab the light with my hand and grip the sliding head at the chamfered section - this allowed me to zoom in and out without needing a second hand. There is no moonlight mode - the spacing is advertised as 10, 200, 400, and 850 lumens. This spacing is good. I am not a huge fan of long press for off, but it's a choice Lumintop has made on all of their e-switch lights that aren't using one of the popular ramping UIs. You need to go through strobe to get to lockout, but lockout is a bit of a misnomer - this mode is actually a momentary low mode. 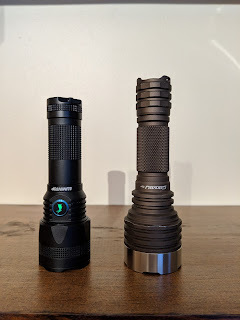 That is a feature I really enjoy, and I hope Lumintop continues to do this. 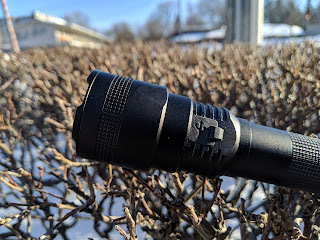 Being able to use the light for a quick check without worrying about the cell draining is fantastic, and users wanting full lockout can physically loosen the tailcap. 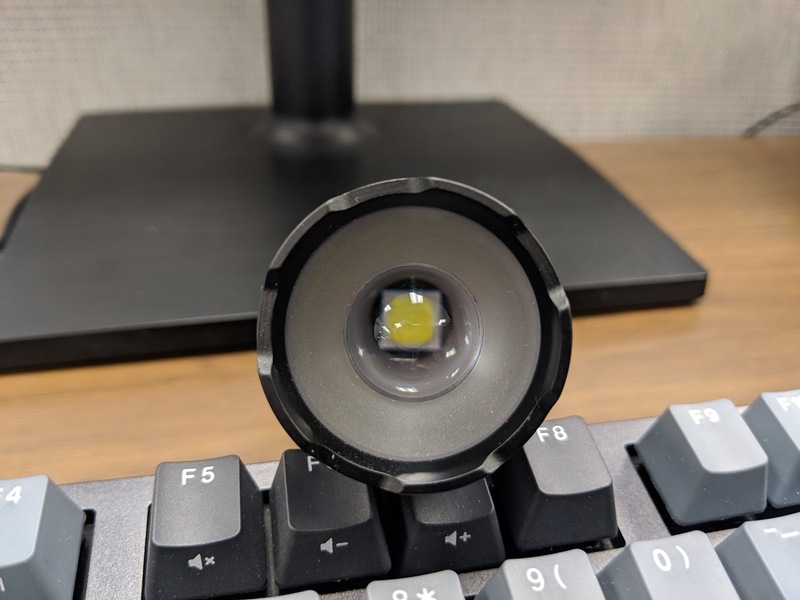 Many focusing lights use an aspheric lens, but this one is a bit different - it's actually a TIR lens, with an aspheric portion in the center. When zoomed out to a floody beam, looking through the lens gives an enlarged view of the LED. The beam is a smooth circle with sharp edges. Behind this lens, lumintop has chosen a cool white XP-L HD for this light. 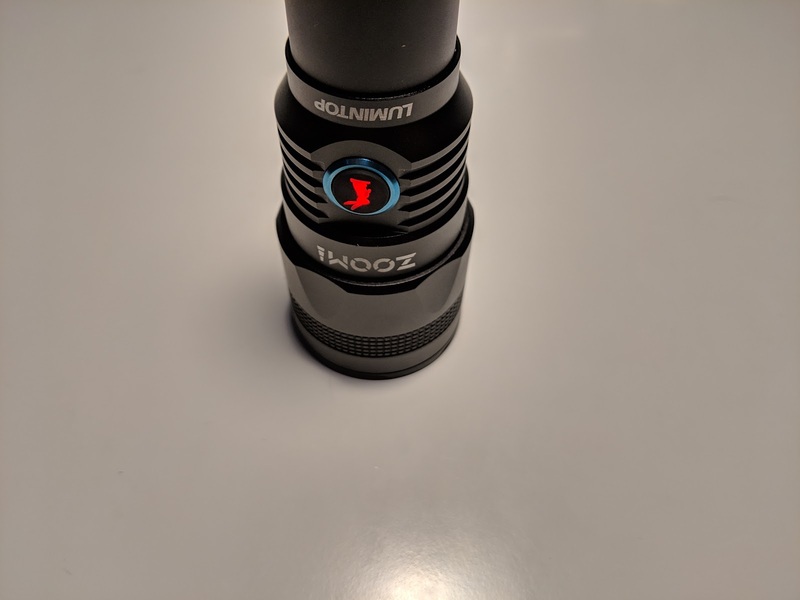 Zoomed in, looking into the lens seems less focused and is far more enlarged. The beam of light gets a more intense hot spot, but also has a bit of spill unlike aspheric beams. The video above shows the beam against a brick wall, as well as how the light can be focused with just a single hand. The light is powered by a single 18650 cell. 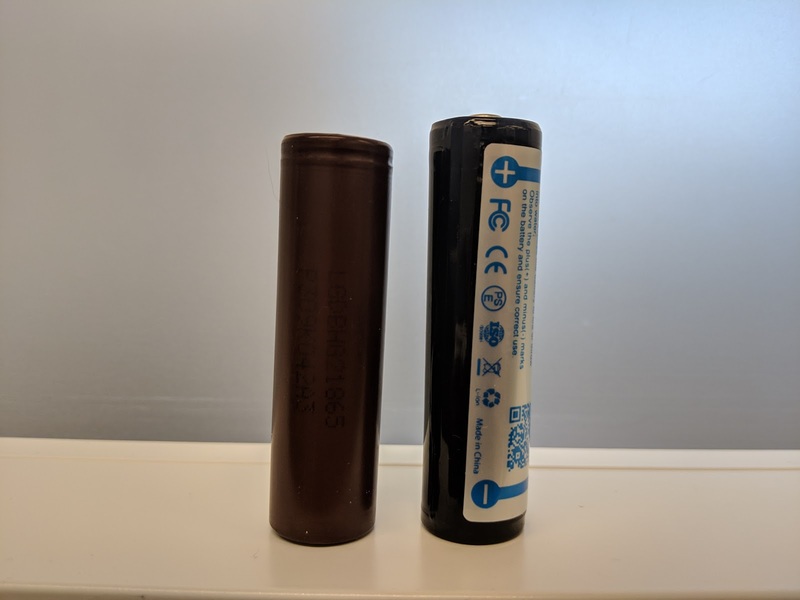 It ships with a protected 2600 mAh button top that measures 70 mm long, but it has no issues running from an unprotected flat top thanks to the springs at each end of the cell tube. Whenever the tailcap is fully tightened, the indicating LED under the switch is lit. I really like this feature, but it does mean there's some drain on the cell. I measured this drain at 28 μA. 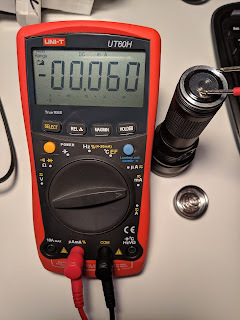 In lockout mode, this increased to 60 μA. This low current would take just under 5 years to drain the included cell. At those rates, the self discharge of the cell is likely to be a bigger factor. Runtime was tested with the included cell on turbo and high. It can be seen that turbo steps down to high after about 5 minutes, and both runs are stable at close to 50% of the output at 30 seconds. Both tests ended at just about the advertised runtimes, which is good. As this is a focusing light, the chosen focus will affect the overall output. My tests showed that overall output was reduced about 15% when the light is fully zoomed in for a throwy beam, as a trade off for the increased beam distance. Charging was measured from the USB port, bringing the internal cell from dead to full. 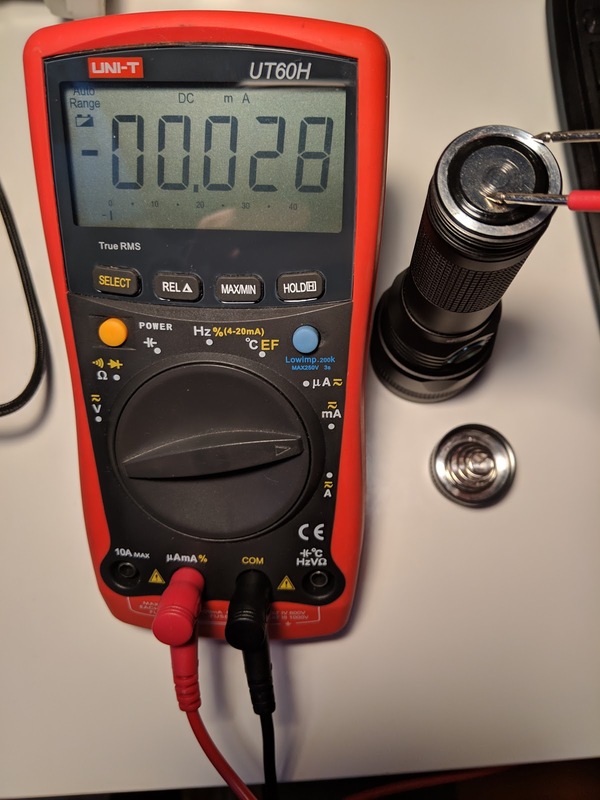 Charging started at a relatively high 1.8A, but there was no constant current charge segment - instead, the charge current dropped steadily, cutting out when it got below 0.1 A. 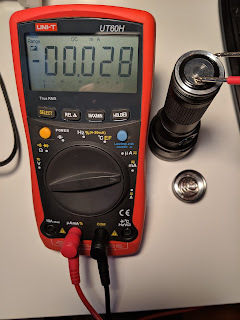 When the light is charging, the indicating LED glows red. When fully charged, it changes to blue. 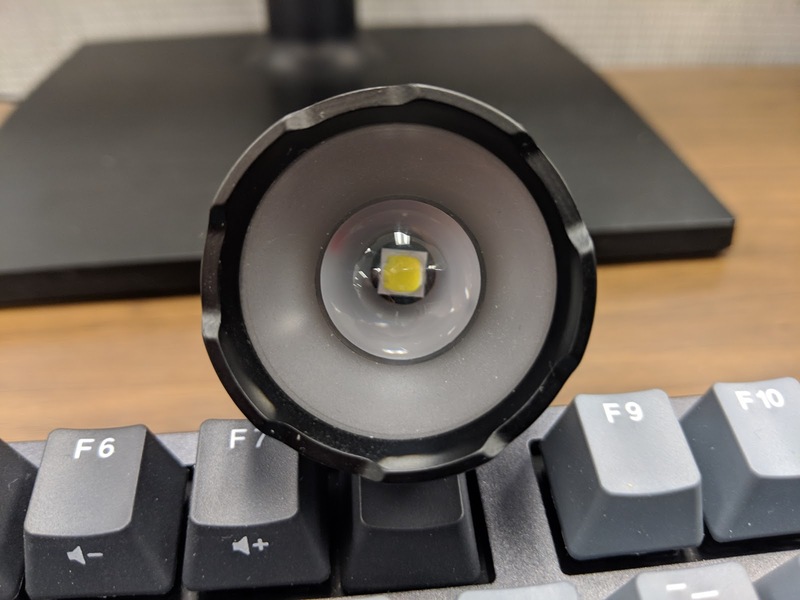 If the light is plugged in without a cell, or the tailcap is not fully tightened, the indicating LED will strobe through all available colors to alert you that something went wrong. When the light is charging, it can be used with the same UI and modes as when unplugged.